One of a nurse’s most important duties is to keep an eye on the status of patients, and then react quickly when an emergency arise. In the past, nurses made regular rounds of the ward by walking from room to room to administer medication, make sure patients were resting comfortably, and take blood pressure and temperature readings. WebSCADA medical solution provides an economical way for nurses to monitor all the patients in their wards at the same time. Since WebSCADA communication gateway is small, it occupies less space and is unobtrusive. 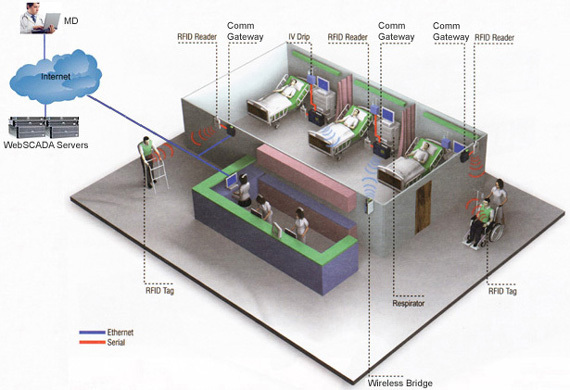 In WebSCADA medical system, the gateway is used as a front-end embedded computer to collect data from the machines and monitoring equipments in the patient’s room. The data is then transferred to WebSCADA servers for processing, so that the team on-duty can monitor the status of all the patients at the same time on web browsers. If patient’s monitored parameters are out of preconfigured range, alerts are automatically generated and delivered to nurses for immediate attention. FRID readers can be connected to the gateway as front-end controllers to track the position of patients. Once the patients have RFID tags with them, nurses can easily identity where the patient is and respond to any emergency promptly.